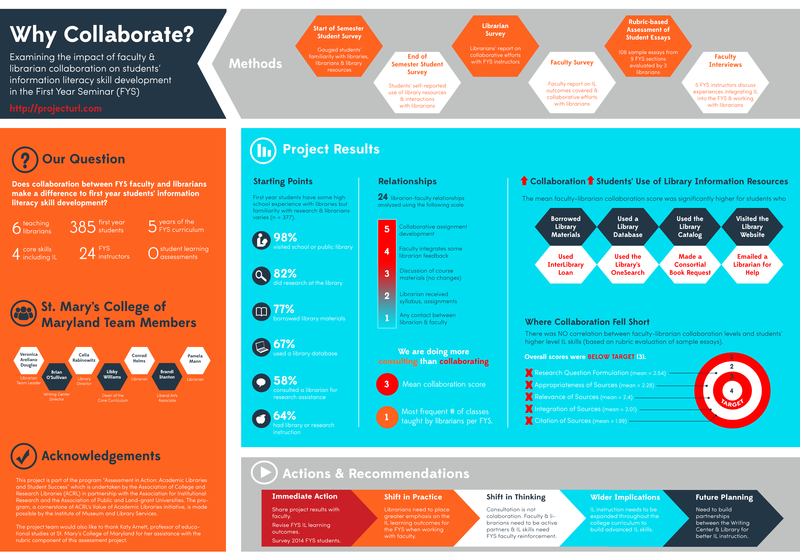 I’ve been working on a poster for my institution’s ACRL Assessment in Action project for the past month or so and it’s easily been one one of the toughest things I’ve had to design EVER. With ALA and other summer conferences around the corner, I’m willing to bet there are plenty of librarians and library students in epic-poster-design-battle-mode at the moment. So let’s talk posters, research and pictures. 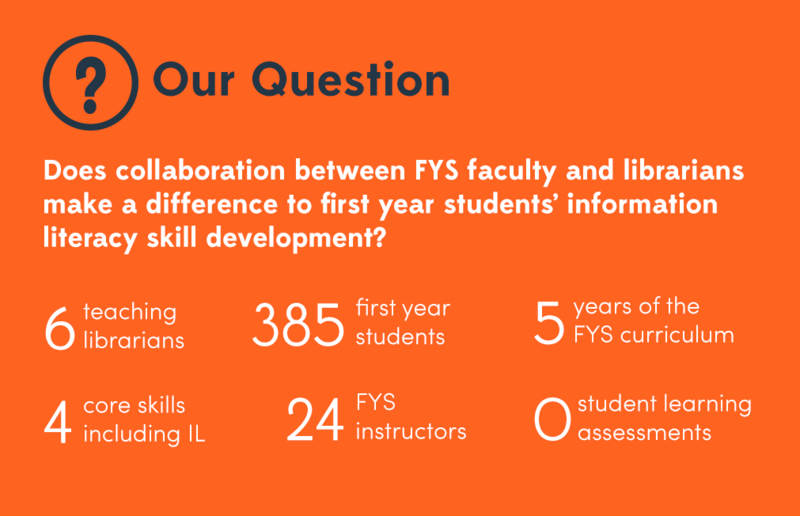 To sum up our AiA Project: The St. Mary’s College of Maryland team was interested in learning if faculty-librarian collaboration had an impact on students’ information literacy (IL) skill development in the First Year Seminar (FYS: a required course for all first year students). It was a multi-method assessment: student surveys, faculty surveys, librarian surveys, rubric-based assessment of student essays and faculty interviews. This made coming up with a poster design particularly challenging since there was simply SO MUCH INFORMATION to share. After hearing from an AiA cohort member who was taking a really simple, conversational approach to designing her project poster, I knew that I wanted to try to replicate that approach as much as possible. There is only so much information you can take in from a poster, and I would much rather be talking to people about different aspects of my project than having them squinting at the text above my shoulder. I still think the poster is kind of busy, but to be honest, I’m so tired of it right now that I’m willing to let it go through the AiA peer review process and worry about it next week. It still needs alignment adjustments, and I’m not totally sold on the white font on the blue background, but it’s something! Methods: All of our assessment pieces were part of a greater whole, and took place at various points throughout the semester. I was inspired by other AiA colleagues who took a timeline approach to their methods section and thought this was a nice compromise. Research Question & Background: This was originally a long paragraph with background information about our First Year Seminar, our IL outcomes, and our assessment project. I decided that if someone really wanted the long story, they could visit our project website (which I’m in the process of developing) or just ask me more about it. I paired down the research description to the just the essential question and basic facts about the FYS and our involvement with it. Results: This is just a portion of the results section, which was easily the most difficult section to develop. I’m still not totally pleased with it, but I wanted to try something other than bullet points and graphs. I don’t know if I did the right thing leaving out numbers and I may go back and change that, but again, I think if people want the finer details I can refer them to the project website with averages, t-test scores and correlation scores, right (I hope)? What kind of posters are you working on for conferences this summer? What’s your approach to visualizing your research? I dig the poster design. Well done. One suggestion I might make would be with HOW the viewer will read it – the logical order they would follow. As it is laid out now, the arrow from the title connects to the methods (though in reverse), which makes it the second thing the viewer is likely to read (by virtue of the connection). You might wish to have your arrow point down, instead. Or come up with an other method to lead the viewer through the content in the order you have in mind. Andrew, that’s a really excellent suggestion. I was hoping that people would look at the background information on the left column first, then follow the title area to the methods section. Sometimes I’ve been staring at a design so long that it helps to have someone else’s opinion about how others may view it! When will you be presenting this? The ACRL Assessment in Action Poster presentations are taking place at ALA Annual Conference. My poster session is on Friday, June 27 from 2-4pm and a second session will be held on Saturday, June 28 from 8:30-10:30am. Do you mind sharing this template? If not I completely understand because it is your work! I just LOVE this. Or would you mind sharing how to design one similar to this? I love how it is divided up into the different sections. I have no idea how to make one like this on PowerPoint.